1996-09-07. Good. Ships with Tracking Number! INTERNATIONAL WORLDWIDE Shipping available. May not contain Access Codes or Supplements. May be ex-library. Shipping & Handling by region. Buy with confidence, excellent customer service! Mcbride Pub, 1996-06-01. 3rd. Paperback. Used:Good. Mcbride Pub, 1996-06. Paperback. Good. McBride. PAPERBACK. 0930313046 3rd edition, 5th printing, 1996, small stapled booklet, 93 pages | this copy has loss from front cover upper right corner (image to follow), otherwise appears unused | professional booksellers based in the UK | we package with great care and usually dispatch within 24hrs, always within two working days | please request scans or further information on any of our listings, which are all in stock and ready to be dispatched . Good. U.S.A.: McBride Pub, 1996. BRAND NEW. 3rd Edition 6th Printing. Stapled Softcover. New. Hartford, CT: McBride, 1996. Third edition. Paperback. New. 93 pp. [15 cm]; orange wraps, saddle-stitched. An essential guide for identifying issue points for book sellers and book collectors. Hartford, CT: McBride, 1996. Third Edition/Sixth Printing. Paperback. Fine/fine. 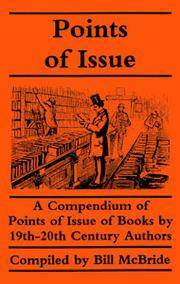 A Compendium of Points of Issue of Books by 19th-20th Century Authors. Third Edition/Sixth Printing. Paperback.